tribal gives us music freedom! 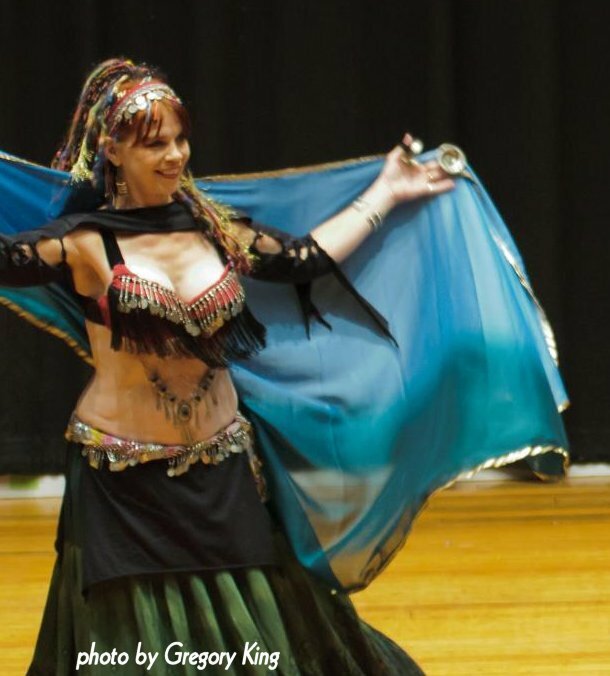 One of the BEST things about Tribal Improv belly dancing is you can change the music whenever you want! Sometimes my students bring me songs to check out so we get a wide variety of styles that way. And I often ask my students what songs they want to use in a show. Not possible with choreography! If you perform a choreographed piece, you’re obviously “stuck” using that music. So I’m enjoying picking the music for our upcoming show. We’re bringing back “Love Signs” by DJ Dimi, a really lovely song that’s going to be perfect for Tribal Veil and Arm Patterns because it’s a medium tempo: Love Signs on Amazon.com (Ai-De-Xin-Hao), from the Zen Lounge cd. This song has a good beat, and the melody flows like a river… so pretty! I’m looking forward to dancing to it again. not like we planned it, but just as good! Mixed levels! Always a challenge, and only more so in a performance, when “stuff happens” and everyone’s excitement level is already high. We had the unexpected happen onstage recently, but my students rocked it anyway! For our annual Recital, I planned to have all the students onstage dancing during our four-song Tribal Odyssey set (all music from Tribal Soup); this included levels 1 – 4, because there were only about a dozen dancers performing in the show. The “plan” – and we know how antithetical “planning” is for group improv: it always proves true that the more a set is “planned”, the harder it is to dance in the moment. But anyway, the plan was that we’d have two Tribal Veil trios begin our set, with the rest of the crew coming out into a Chorus Line, ready for the next song. However, the best laid plans…! I first noticed something awry from my post at the sound system when only a couple of Veil dancers came out – and no one else. I went backstage since I was joining them anyway, and found out what was happening: one of the first Trio dancers couldn’t get changed quickly enough, and was still in the dressing room. So now we had a Tribal Veil duet dancing onstage all by their lonesome. This unexpected glitch (what other kind is there?) was casting some students into a frazzle, since it upset “the plan”. Oh well, what is it they say about the best-laid plans? Oh yeah – they don’t work so well with Tribal Improv!! 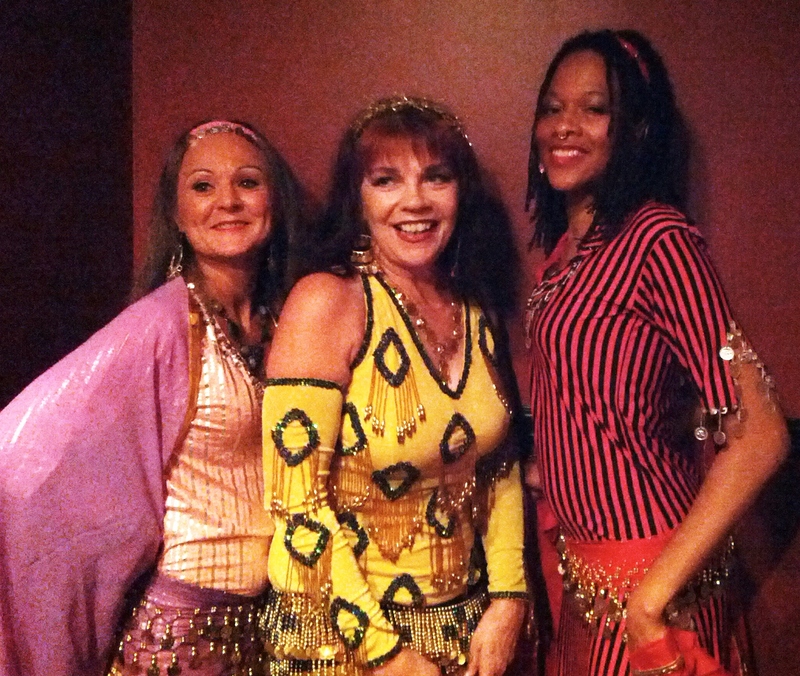 I quickly shooed everyone else out onstage to quiet them and continue the set; our struggling dancer came out of the dressing room and joined the next Veil trio. We resumed our Tribal set after this little hiccup and from the audience side I’m sure it looked fine – even if the entrance of the rest us was a bit out of place in the middle of the song. Whatever! Let’s just get onstage and get it on! Have you had Tribal Improv plans go awry? Tell me in the Comments! 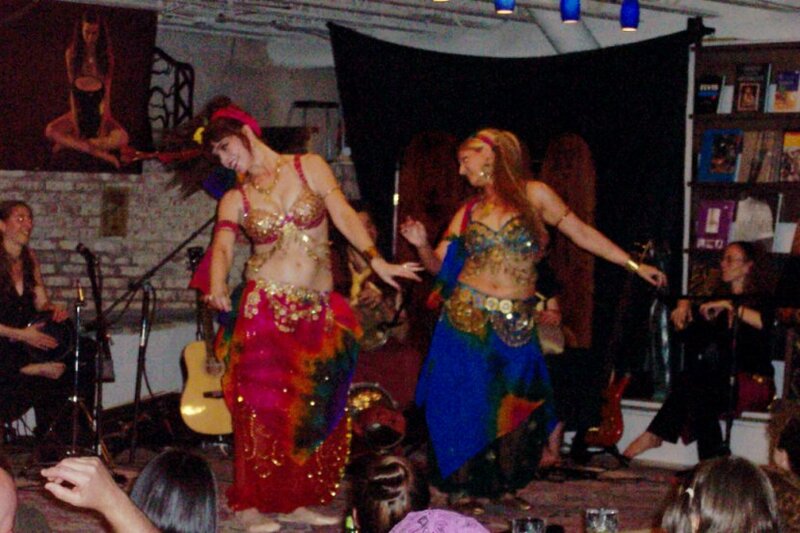 You would not believe (unless you’re a bellydancer!) what a workout you get by dancing with a veil! Especially in a group, doing follow-the-leader! Not only is it challenging to keep up with the leader, but when YOU are the leader you better be on your toes, so to speak… those veils are always moving. 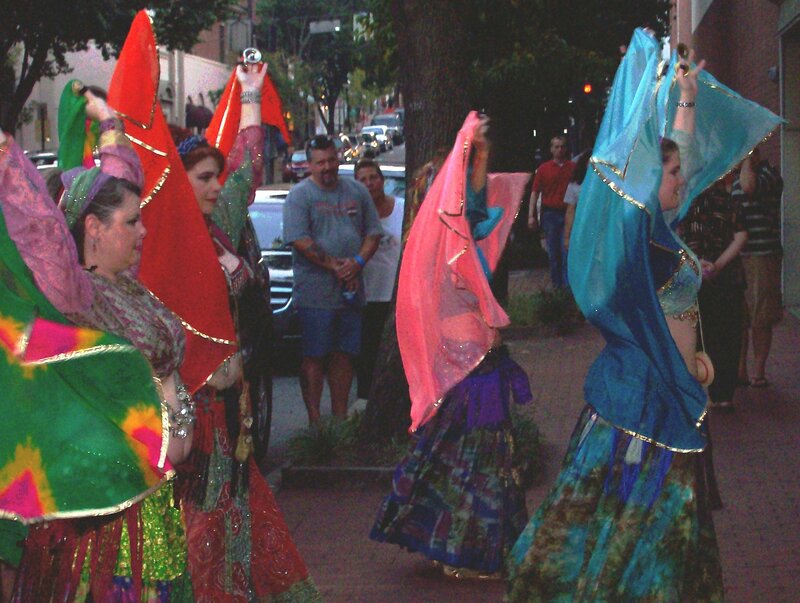 Unlike other types of tribal improv combinations, veil dancing has practically no “resting” combos. It’s go, go, go, all the time to keep those veils flowing. Maybe I should’ve added some “veil pose” combinations where we could catch our breath! Well, that’s something to think about for the future. For now, we’re all getting our arms toned by practising the veil combos for our annual recital at the end of the month. 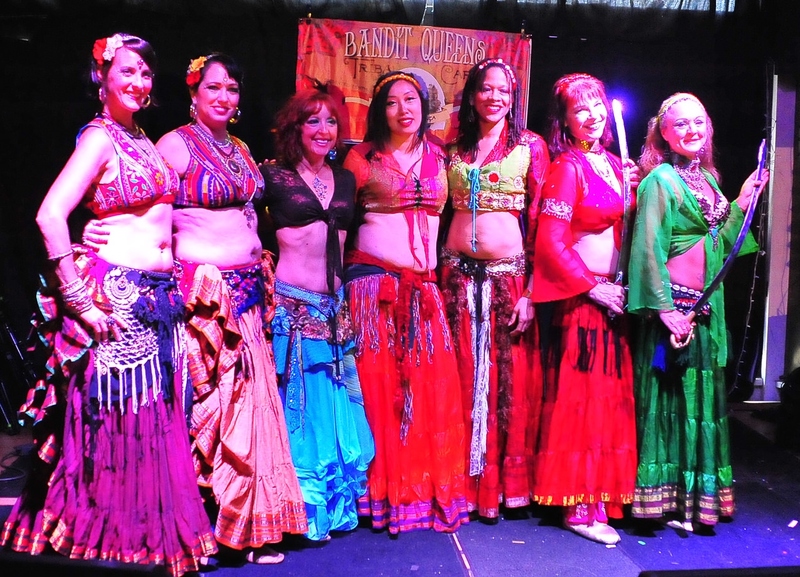 The advanced dancers will be leading the whole group onstage during our Tribal Veil song, to dance with veils downstage while the rest of the group is in a Chorus Line upstage. It’s fun having a large mixed-level group onstage together! Meanwhile anyone who wants a challenge can add these Tribal Veil moves to their troupe repertoire by following this Playlist on my YouTube channel. Yes I was hot, yes I was sweaty, but I did it anyway! The Veil Combinations are on video ready for viewing on my YouTube channel Dance Eternal. Anthea’s veil magic in action! That photo’s a great shot of my “veil hold”, with finger cymbals at the ready. I’m using a large two-tone veil, slightly rounded at the bottom edges and trimmed with gold ribbon. What type of veil to use really makes a difference. 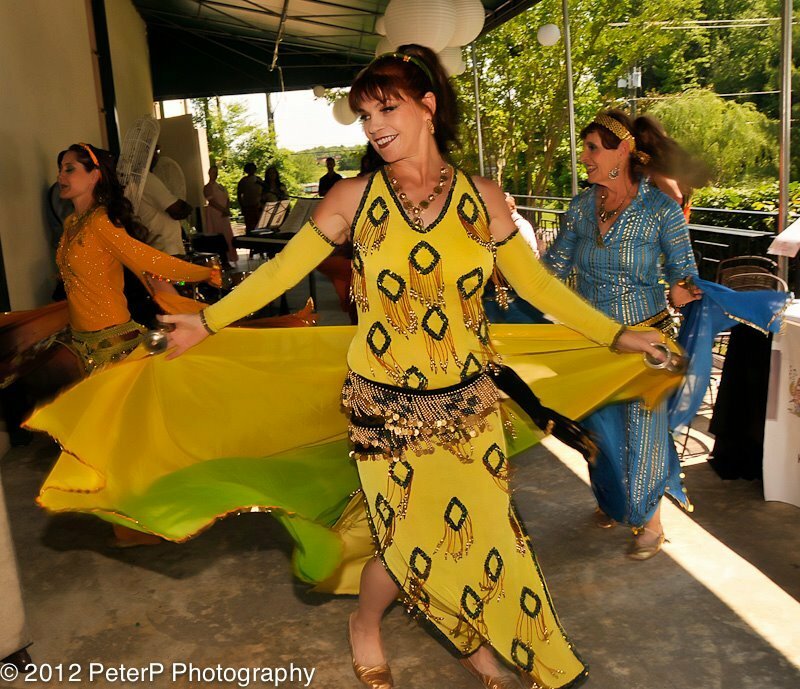 In Oriental dancing we use all different shapes, sizes, and fabrics for veil dancing; and the type of fabric, the size and shape, and any decorations like trim or sequins, all change how the veil moves. For these group improv combos though, we needed a veil sturdy enough for constant use. I’ve also always loved the way circular or half-circle veils move. I finally found the perfect veil, and it even works well in a light breeze! The Tribal Veil combos are developed especially for this particular fabric weight, shape, and style of veil. Some of my students have made their own veil complete with the trimmed edges, but most of us get our tribal veils from Ganesha Bazaar. Both the large and small size works and we’ve used both. Usually we use the larger size, and save the smaller ones for tight performance spaces. I’m sure the Veil Combos can be done just fine with other types of veils, I’ve just never tried it. 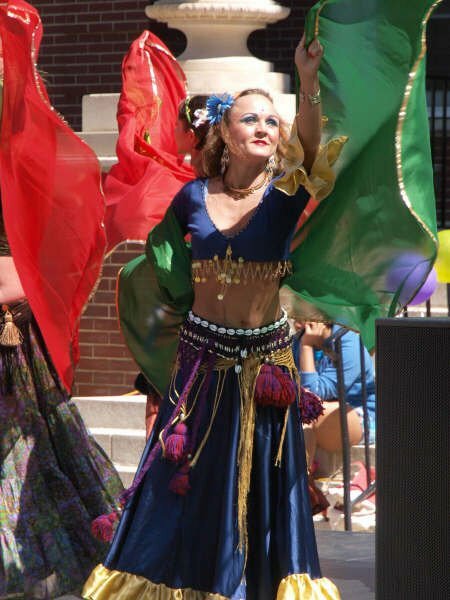 With all the costume layers of skirts, sleeves, tassels, plus big flowery hairdids and whatnot that us tribal dancers like to use in our costumes, I want to stick with what works! out of the box and loving it! Our June events around town rocked! I love how TOBD is proving to be so versatile, so easy to adapt to fit our needs. I guess I just love it’s USABILITY! Once I realized we’re not locked into always looking “Tribal” and don’t always have to use our typical tribal music, my eyes really opened to the possibilities. I guess that’s funny coming from me since it’s my baby – you’d think I’d know TOBD inside and out – but I guess I had to see it with new eyes, so to speak. During my solo career I danced at hundreds of parties – in homes, offices, various workplaces, event halls, pool parties, nightclubs, you name it. I know how to work an event, deal with pretty much any performance space, no matter how the audience is arranged or how the space is set up. As a soloist you learn to walk into a place, evaluate it quickly and decide how best to showcase your performance. What invaluable experience! 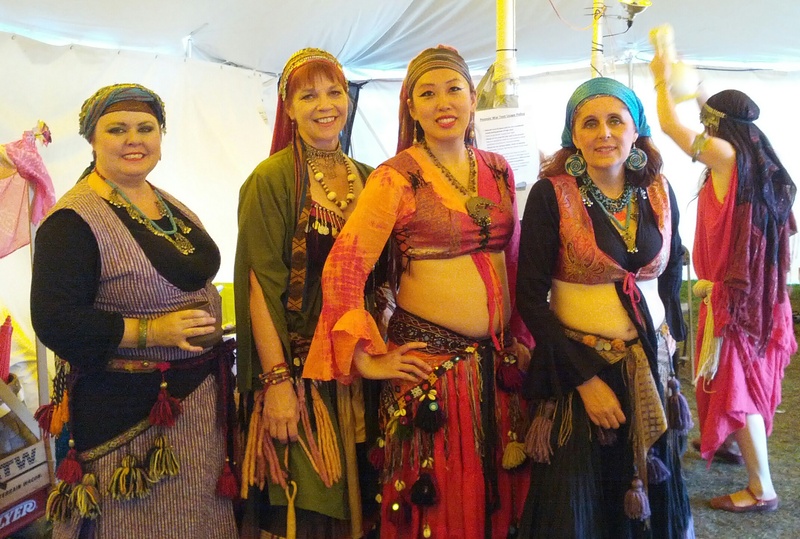 So here we are doing tribal improv, looking very “cabaret-flavor”… dancing with veils to a shortened version of Ragheb Alama’s Saharony Ellil. Next we banged out some cymbal action to Nancy Ajram’s Baddala Aleik, also taking turns at with solo improv during the taqsim of this lovely song. Finally, pulling out the old favorite Habibi Ya Albi by Ihab Tawfik, we went out for audience participation. That song is gold and had the expected effect on certain folk in our audience who couldn’t resist dancing and even singing along. Yes, the PRISM Dancers know how to work it! We only did two song’s worth of dancing for the demo. The first number let us dance together as a tribal trio, then we each went out among the audience, having a lot of fun with the brave participants, then we returned to our TOBD trio to finish the song. We used one of our favorite swing electronica songs, Come Dance With Me (Shirley Horn/Sugardaddy remix). For the “how to” part of the demo we used Solace’s Beledi Drum (from Rhythms of the Dance), inviting audience members up to join us – including one sweet little girl! It was a blast! What I love about my PRISM Dancers is that they’re game for new adventures, and go with the flow. They keep it happy and share the joy. All this and TOBD too – what a blessing! A few weeks before the show, we picked Shashkin and Caravan for our music and choreographed a set that included an Entrance piece, Veil Dance, and Drum Duet. 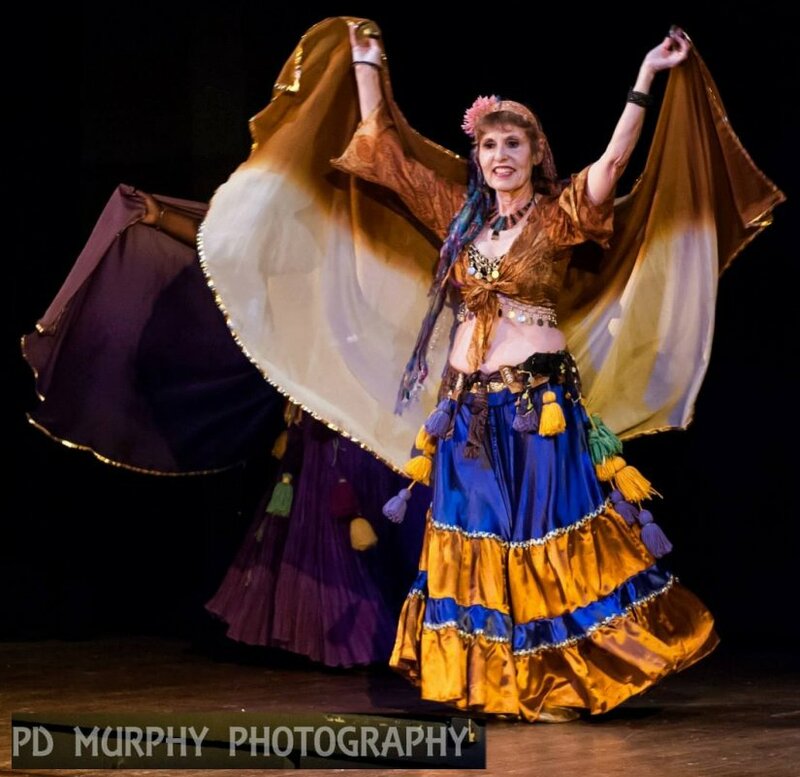 Rather than go with choreography for the whole set we decided to use Tribal Odyssey for the Veil segment. Check out the video below: at 2:22 we go from choreography to duet improvisation. Actually, we knew we’d use the Veil Walk, a traveling combination, to circuit the stage etc. during the song’s transition from slow to fast tempo. So that’s partially choreographed; but from about 2:50 on – when we get in the “lead-and-follow” position together – it’s duet improvisation. We decided ahead of time that we’d each do two or three veil combos then change the lead… as you can see the Veil Walk is used for lead-changing too. This demonstrates something I tell my students: Tribal should serve us, not the other way around. TOBD has rules and guidelines, yes. But the format is meant as a path to follow, as a means to an end – the “end” being a joyous group dance experience. The format is not an end in and of itself. We’re not here to solidify it into something inflexible, written in stone. It’s to be used as we need it, and adapted to the different performance venues, locations, and contexts that we face. 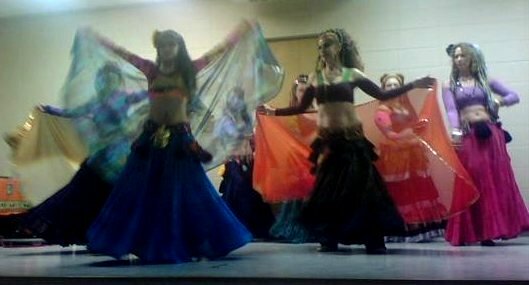 This show is from 2005, before we started using Miramar’s formation of the Circle in Tribal Veil dancing. We began using that option a couple of years ago and I really enjoy having that extra element of variety in the format. Of course this wasn’t the first time my students and I danced Tribal Odyssey to live drumming, but it WAS the first time we used TOBD in a professional showcase with live music. And yes, we got paid!